Canadian artist Terrell Welch recently posted this photo (left) and invited folks to write a story to go with the photo. I wrote two. Below is Tom and Lennie follows. 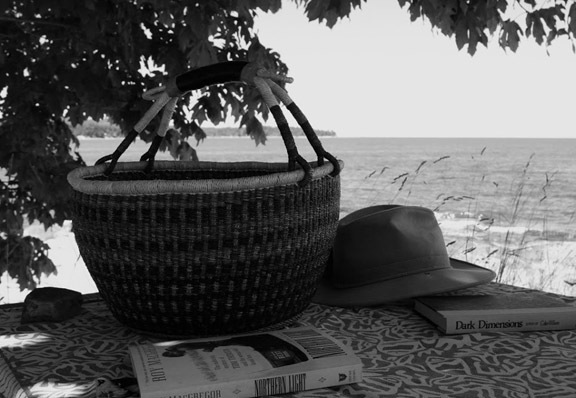 She tossed the two books, her hat, and the basket on the blanket, then stood there looking out to sea….to the South China Sea to be exact. She felt about a million miles away from her Vancouver home. Yet there was something comforting about the fact that these two cities were facing each other across a wide ocean as if the waves made conversation possible. Here she was again, following him. Following Wang. Always following Wang. His name meant King in mandarin which was appropriate. He behaved as if he were a king. Back home in Vancouver his family, his employees, all their friends, she…all treated him as royalty. This time, though, she had the good sense to stay on Lantau Island instead of a glass and steel high rise in Wan Chi. It was so much quieter and greener here on Lantau. He told her he would come later that morning after his meeting. She sighed. She picked up the book on Canadian artist Tom Thomson. She loved Thomson’s work. Landscapes are supposed to be intense, she thought, and she believed that Tom would have agreed with her. She wished that they could talk. He’d been dead a long time, and his death was just as interesting as his life. Was it suicide or murder? Maybe the book would tell all. She really wished Tom could come back to life and visit her in her own studio. She laughed to herself that she was calling him by his first name - as if they were intimates. She knew what Tom would say if he could visit her studio. He would tell her that her work was suffering because of her relationship with Wang. She could hear him asking, do you really believe that he relieves your loneliness? Is that man worth giving up your art? The other book she barely glanced at. She found it in a restaurant in the airport. It was one of those that a reader had left to be read again and then passed on. Tom was enough for her right now. An elderly man in an old faded blue Mao jacket – the kind that is very fashionable now in Paris - crossed in front of her close to the shore. He had one of those huge paper dragon kites and a roll of sturdy cord. He lifted his head frequently and turned into the wind, testing. He kept walking waiting for the right breeze. She sat on the blanket and stroked the book about Tom. She closed her eyes and thought of all the paintings she wanted to paint but had not painted. She hadn’t finished a canvas in six months at least. All the work she was showing now was old. Worse, there was an unease in her that hadn’t been relieved in months. It felt like she had a hole in her life that Wang could not fill. The blanket called to her. She fell asleep. Her mobile’s ringing woke her. It was Wang. I’ll be late – maybe this afternoon? he said. We’re making progress on a multimillion dollar deal. She could hear the unspoken words. You can wait until I have time for you, and that won’t be anytime soon. She said good-bye to Wang, put the book about Tom in her basket, and left the blanket and the other book in the sand. She turned away toward the village where she would find a taxi that would take her across Lantau’s ridge of mountains to the Hong Kong International Airport. She was going home. Back to her studio. Back to her painting. Thank you, Tom, she whispered. Lennie took off his socks and shoes and rolled up his pants legs. He was in the shade of some miserable, hard-scrabble tree that didn’t belong on a beach, any beach, so he didn’t need his hat. He tossed it on the table along with those two books that he had lifted from the restaurant down the street. The basket he placed more carefully. It was heavy. Leaning back into the beach lounge chair he sighed. He tried to relax. He was doing his damndest to look like a tourist in this god-forsaken place. Why the hell people actually spent their money to come to Florida voluntarily was beyond him. He missed Brooklyn. He could see Joanie down the beach close to the water. Her summer flowered sundress moved softly in the breeze that was coming off the ocean. She was barefoot, and carrying that big straw hat in her hand. She stopped to talk to a couple with a dog. Lennie watched her lean down and pet the dog. She was smiling. She looked like she belonged here. Joan’s ability to blend in to the surroundings never failed to amaze him. And lie. Oh, how that girl could lie. Someone would ask her a question and she would spin out a detailed story that had no basis in reality. Sometimes, he felt with no small discomfort, that everything she said to him was a lie, too. An hour ago Joanie’s ability to blend in had served them well…perfectly In fact. The first thing they had done was to steal a maid’s uniform from the employees’ locker room in the basement of the high-class, expensive resort hotel. The employees’ room had been locked, but Lennie had a gift (and the right tools) for unlocking doors. Joan dressed quickly in the uniform. Back in the hall, she grabbed an unattended cart with clean lines and mops, gave Lennie a quick kiss, and off they went. He unlocked the doors, and walked to the end of the hall by the exit to linger in case anyone showed up. He didn’t want to be seen lurking by a room door. Joanie went into the rooms looking like a maid on duty. She became mostly invisible to hotel guests in that uniform. Inside the room, she did a quick search and come out with handfuls of jewelry which Lennie stuffed into the basket. They did two floors in half an hour, Joanie only going into rooms that they knew were empty. They filled that basket with jewels, and then they quit. Lennie knew better than to let greed take over. He’d spent two years in the clink for being greedy, and he wasn’t going to make that mistake again. There were plenty of jewels to choose from. Why the hell people brought jewels to the beach was beyond him. He figured that he and Joanie were just relieving these rich tourists of any ridiculous urge to wear a diamond and emerald necklace with a bathing suit. Lennie jumped, completely startled. He hadn’t heard the girl coming up behind him. Hard to hear footsteps in sand. He hated Florida. Lennie opened the newspaper while he watched the waitress out of the corner of his eye as she walked away. The date was February 7, 1946. The headline blared, “Our Boys Are Coming Home.” Lennie had seen a bunch of very drunk ex-servicemen last night. He knew they were sleeping it off this morning at cheap hotels all along the beach. But now was nearly noon, and they would be pouring out onto the beach, including this one, any minute now. They would order margaritas and make passes at all the girls who walked by. That included Joanie. Especially Joanie. She was too pretty to ignore. Lennie decided in that moment that as soon as the soldiers appeared, he and Joanie would depart the beach. But they wouldn’t go inside for a late breakfast like he told the waitress. Hell no. They were going straight to the train station and buy two tickets for New York. Lennie would hold that heavy basket to his chest until they were safe on the train. He sighed again. Just the thought of New York made him feel relaxed for the first time in days.